With the speed that tech evolves, coding bootcamps need to constantly iterate to keep their curriculum relevant for students. New York Code + Design Academy is working on a big revamp to their curriculum, which includes tweaks to their teaching approach, adding simulations of a real, agile work environment, and expanding the course to Philadelphia. NYCDA has assigned the task to Elyse Kolin, an Instructional Designer with a Master’s in Adult Learning and experience developing curriculum at Udacity. Working with Elyse is Orlando Caraballo, an experienced software developer with a traditional computer science degree. We asked Elyse and Orlando to explain the new changes and why they’re important for student success. The length of the course will change from 12 to 14 weeks. Changes will apply to the Software Engineering Intensive course. The goal of this revamp is to train NYCDA students to be self-sufficient, critical thinkers who are ready to contribute to their new jobs from day one. These changes in New York will go live in January 2018. NYCDA is also launching a new Software Development Intensive in Philadelphia, PA in July 2018. 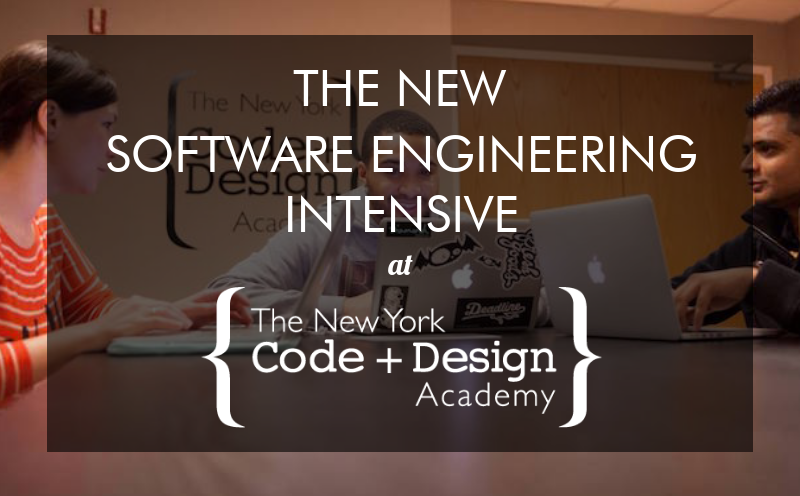 What made you excited to work at New York Code + Design Academy? Elyse: I’m passionate about innovative approaches to adult education, so I was excited to work with NYCDA. They’re combining technical training with a more holistic education and they’re taking a cutting-edge look at a problem that many people are trying to solve. Also, the staff and students are wonderful – I love working with such passionate, solution-oriented and caring individuals. Orlando: I was a senior developer at my job for about two years when I decided that I needed to transition into a career that’s truer to myself, and that’s how I found NYCDA. I found that NYCDA as a whole was very passionate about delivering a great student experience and that inspired me to be the best instructor I could be. What drove these changes to the NYCDA curriculum? Orlando: After teaching four cohorts at NYCDA since 2015, I noticed some gaps in our current curriculum and I had the opportunity to start filling those in when I became a Subject Matter Expert. When Elyse was hired in 2017, as an Instructional Designer, we were both tasked with revamping the current program. Employers expect developers to graduate from NYCDA as critical thinkers, and to be able to jump into a new language on the job if necessary. All of these changes are meant to transition the current curriculum into a program that produces a software engineer who is a critical thinker, can hit the ground running, and is very passionate about what they're doing. Elyse: These curriculum changes are also based in research. Before we started redesigning anything, we did a thorough survey of the industry. We looked at what's competitive in the job market, what alumni need, and differentiated buzzwords from data. We learned that students must be able to build finished projects, learn independently, and communicate with others. We’re redesigning the curriculum to help them do all of these things more effectively. Tell us about the major changes to the curriculum. 1) Software Development Core: Programming fundamentals and computer science fundamentals like algorithms, problem-solving, critical thinking. 2) Project-based learning: Group and individual projects including milestone projects. We’re employing a method called Scaffolded Independent Learning, which really puts a lot of the ownership and power into the student because they can actually make decisions about how they want to proceed through the course. The whole goal is for our students to guide themselves to become an independent software developer and not somebody who relies on a teacher for all the answers. 3) Integrated workplace simulation: We utilize agile methodology, coding challenges, whiteboarding, midpoint reviews, interview practice, and presentations. We also have students build their own individualized project plan so that after they leave the program they can continue to teach themselves the necessary skills to be successful. Could you tell us a bit more about that integrated workplace simulation? Elyse: In the full-time intensive programs, our students are typically career changers. We want to make sure the curriculum is aligned to their new jobs. The existing WDI is 12 weeks long, and it’s very heavy on technical skills. We realized that there was an opportunity to create a slightly longer program that also incorporated relevant professional and soft-skill development. So, this new program is 14 weeks long and integrates workplace readiness. We integrate agile principles, standups, coding challenges, communication, and group projects that have students practice SCRUM roles. We’re also adding fun simulations of real-world projects. Will you do these projects for real companies or do you think these will always be simulations in the classroom? Elyse: The tech industry is always changing and evolving, so our underlying process is iterative. In this version, we’re simulating these projects in the classroom, but we would love to work with a company one day. It's all about testing little parts of our program to see how they work and evolving from there. How do you see the curriculum at a coding bootcamp influencing job placement? Elyse: The majority of our bootcamp students are career changing, so we think it's important to have feedback from everyone involved in the industry’s hiring process. To do so, I conducted a series of interviews and surveys. We found that hiring managers aren’t just looking for technical skills, but they are also looking for someone capable of learning new tools quickly and solving tricky problems under pressure. We learned that we get to facilitate the development of a whole new professional identity. It’s a fun puzzle to solve! Do you think this is how coding bootcamps need to evolve in 2018 – into this more soft-skill focused teaching? Elyse: It likely depends on each bootcamp’s student population. Since many of our students are looking to change their career path, we’ve noticed that many students need more than technical training alone. Since becoming a developer is in many ways a professional “rebranding” or identity transformation, many students also benefit from a curriculum that integrates professional, soft, and problem-solving skills. Being a programmer really means being a 21st-century problem solver. The problems that you're going to be solving are infinitely complex, your tools are always going to be changing and evolving. So our curriculum has to keep up with that. Orlando: Speaking generally, I think it makes sense for bootcamps to experiment with a more holistic approach to education. I can’t say if every bootcamp for certain should transition into this model, but I do think it is worth exploring the possibility. When I helped build this new curriculum with Elyse, I wanted to build a program that was designed to teach critical thinkers. It just so happens that we're using technology to teach people how to think critically. In the future, many of our problems are going to be technology-related, so this transition makes sense for what we envision the future to look like. Many people, unfortunately, have not had the luxury of learning how to develop their critical thinking skills in formal education so our intention is to build this skill set using technology as a pathway. How do you keep the classroom experience uniform across all five NYCDA campuses? Orlando: We have team members who specifically work on keeping the student experience very similar across campuses, but we also do like to have some uniqueness on each campus. Every city and cohort will be different from each other. For example, our students in the DC campus are culturally different from our students in NYC. Naturally, we have to cater those campuses to them. One way we do this is by hiring instructors who are very technically savvy, but who are also empathic. They have to be able to adapt their teaching style to their audience. We train instructors to be dynamic in the classroom and cater to their current cohort. Will you roll out formal training for your current instructors when you make these curriculum changes? Elyse: We realize that this new curriculum involves a lot of new material so we're developing a training program for that. We understand that teaching styles vary and students’ learning needs vary; we want instructors to be able to adapt to their learners. We try to support different types of learners by creating well-researched projects that accurately reinforce core programming skills. We also incorporate creativity and space for independent learning in these projects. How do you measure students’ success at NYCDA? Are there tests? Orlando: We’ve tried many things over the years. In the past, we’ve relied on projects, in-class workshops, homework, weekly assessments, and exercises to reflect what the individual student is learning throughout the course. We also find that it is important for the instructor to measure student success by reading the overall sentiment in the room, identifying the general as well as individual blocks preventing the student from succeeding and mentally noting it as they proceed throughout the course. Both styles of student measurement establish a more complete readout of how the student is proceeding. In the new program, we've kept a similar structure, but the difference is that now a student’s final grade is primarily going to be focused on their project submissions. Individual skills that lead you up to a larger, complete project are important, but a complete project is what we feel is most important for their success. Would a student be asked to leave based on their performance in a project? How do you approach attrition? Elyse: We really do believe in actively supporting a “growth mindset,” which means that if you are putting in effort, learning through your failures, and actively trying new ways to learn a particular skill, then it’s possible to achieve your goal. If you are turning your projects in on time, being communicative with your instructor, and being open and reflective about the methods that you've chosen, then we do allow students the opportunity to resubmit a project if it hasn't met the specific requirements. If you don’t get a project right the first time, you have the opportunity to take ownership of that, learn, and resubmit your work. Orlando: We find it most important that the student grows and understands how to improve, and places less value on establishing hard metrics for them to meet for their own success. Given that our program is primarily focused on simulating a work environment it makes sense we mirror the experience they will likely see when in the workplace. As a software developer, you're probably going to write code that does not function as intended on the first pass. We try to simulate that situation as best we can. The instructor looks at the code you write, gives you advice on what you can do to improve it, and also highlights things that you did right, which very much aligns with the idea of a code review. We encourage students to view this methodology as part of the learning experience as opposed to a hindrance to their learning. What do you think makes a good instructor at a bootcamp? Orlando: A really good coding bootcamp instructor is someone who can connect with their students on a relatively intimate level. You need to know what type of students you’re teaching and what drives them to be who they are. If you can connect with them, then you can cater the material to the individual. As an instructor, I ask a lot of clarifying questions and try to really understand what frame of mind a student is operating under. I want to know where the student is coming from so that I can change the conversation a bit to fill in the right missing pieces. That only comes as a result of connecting. Naturally, when we train instructors we encourage them to establish that connection as well. In that back-and-forth process, the instructor can also learn to be a better teacher, and hopefully, that’s something that they’re passionate about as well. Elyse: A good instructor at a bootcamp often has real-world experience with programming and working on a team. Many of our students will be looking to work in the tech industry, so being able to share that real-life knowledge is really helpful. It’s also extremely important for instructors to remember what it is like to be a learner. You can be the smartest engineer ever, but if you can't empathize with students, teaching will be a challenge. Overall, being kind and willing to learn yourself is key to being a great educator! What do you predict will be the next future trend in coding bootcamps? Elyse: In the bootcamp industry, I think some will continue to focus on programming languages alone. Others may start taking a closer look at the methodologies and teaching practices involved in preparing students for long-term success. We’ve found that preparing someone for a full-throttle career transformation through thoughtful curriculum design is challenging – but ultimately the most impactful for students. Can you identify an ideal NYCDA student or is there a certain type of student that does well at NYCDA? Elyse: First of all, I love our students! They are creative, driven and bring so many unique perspectives to their work. Students who excel in these programs are curious and open to learning through failure. In many ways, I think becoming a strong programmer is actually rooted in becoming an active member of a learning community. So students who do well are often interested in learning from and solving problems with others. Orlando: I think that the ideal NYCDA student is very passionate. Even if they're not initially passionate about tech, as they learn more, we hope for them to grow that passion. There’s this “anyone can learn how to code” movement that has been happening for several years, and I agree with a revised version of that statement. Yes, anybody can learn how to code, but it takes an impassioned individual to become a long-term, successful software developer. When will these curriculum changes go live? Elyse: We are a licensed institution which means that all of our programs have to go through regulatory approval (which is good – it’s there to protect the students). There are multiple phases of regulatory approval in every state that we operate in. We are hoping that we will have the new curriculum ready to go in 2018. Find out more and read New York Code + Design Academy reviews on Course Report. Check out the New York Code + Design Academy website.